I can't even remember the last time I did an outfit post it been so long. I fancied compiling a post of my favourite or interesting outfits. I both enjoy doing these posts, and they always seem to very popular in terms of views and comments interaction. I usually assess a successful blog post according to the number of comments I will attempt to do more outfit posts on a regular basis, a lot of the time I forget take photos. This year, I'm going to either find an outfit buddy to improve the photo quality or start using my tripod. 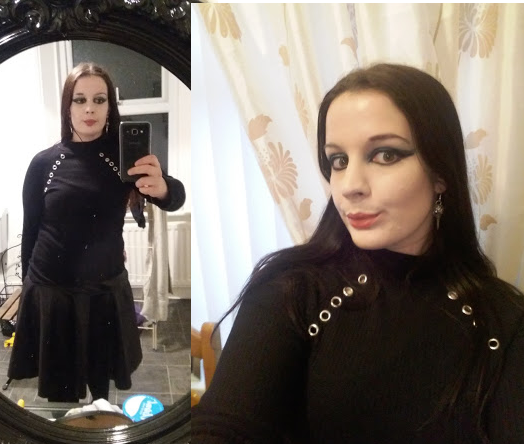 Its taken me years to build up my gothic wardrobe. When I was younger I will admit I used to be very materlistic and when I had more of disposable income, I purchase alot of goth brands. Like Sinister, Omen and Raven, but brands like Kill Star and Punk Rave didn't exist or were very small business operating on eBay. Also, I used to purchase expensive high street brands. My favourite was Debenhams as I loved the Julian McDonald brand. Now, I sew my own clothing particularly skirts. I tend purchase Primark for basic and accessories , occasionally Next and TK Maxx. 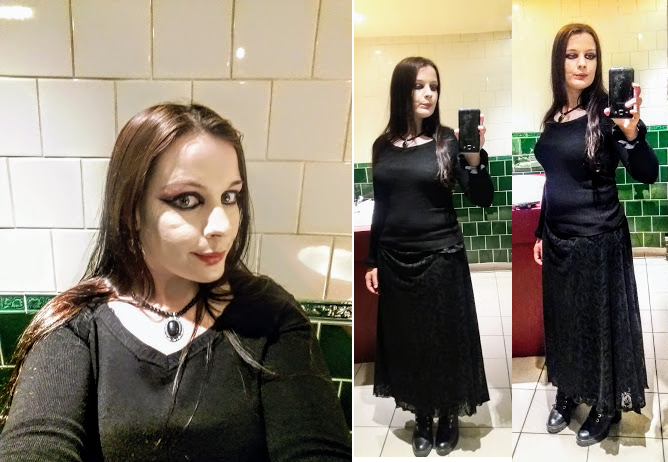 Otherwwise, Most of my clothing is sourced from charity shops; I tend to have good luck, finding the high end brands and gothic style clothing secondhand. 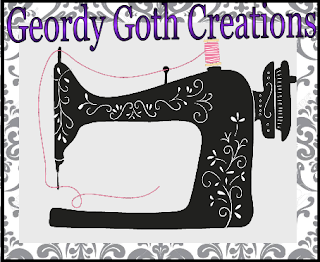 Presently, most Goth or alt brands clothing lacks the uniqueness and quality I remeber by no means are the prices doesn't justifie. I can't even remember when I took this photo. The top was a from Debenhams by Julian McDonald range. I love the slit sleeves which kept together with buttons. This is another item I've had for years. 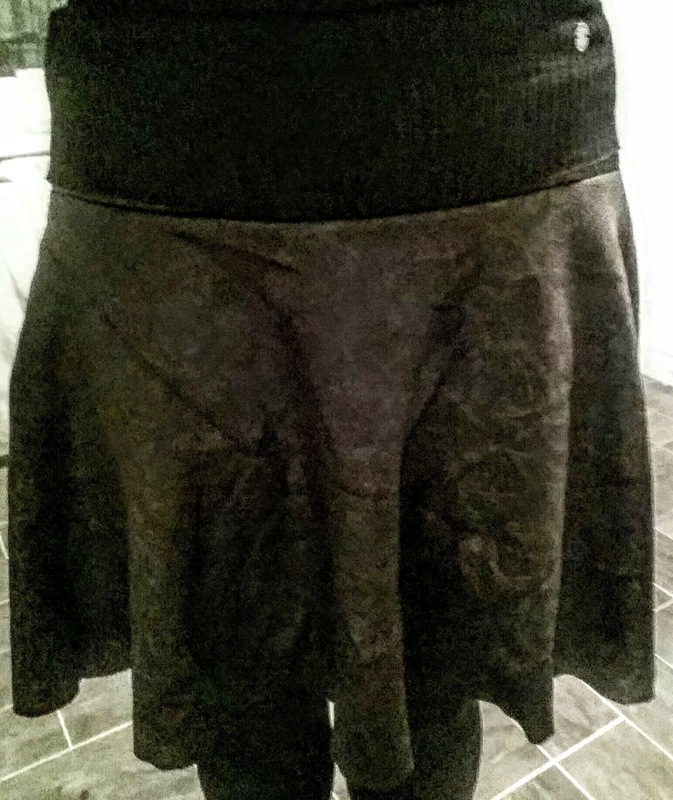 The skirt I made from embossed with roses. This was one I wore with my skirt I made from upholstery fabric that resembles black snake skin, The jumper from Primark. 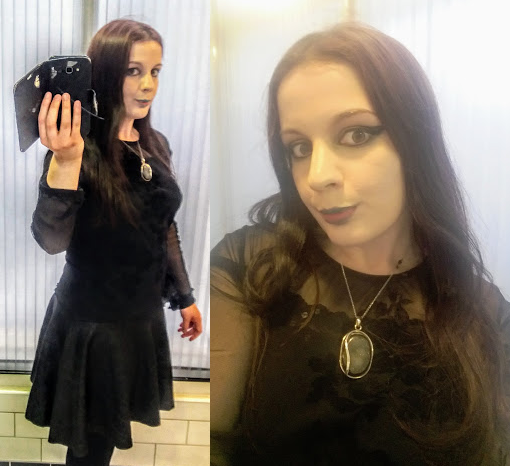 I love Primark as I can often find some gothic looking items, then again I've always bought alot of my gothic clothing from Primark as a teenager. This was the outfit I wore just as I general day for charity shop raiding. The top was viscose with mesh sleeves from another charity shop find. The skirt is one I sewed years ago it has a gorgeous jacquard pattern. The yoke is made from a different fabric I used trim to hide seam line. The belt is another charity shop find it has shiny crocodile effect pattern I love. the necklace is Lapis lazuli or picked from an ethnic shop in Brighton. The boot were ones I've had for years for years from Next their biker boots. This was an outfit I wore for a night out at Grindhouse. The top and skirt were both charity shop finds The corset is my favorite under bust. The boots were from Guess. At the moment, I embracing a Stevie Nicks meets nu goth aesthetic. 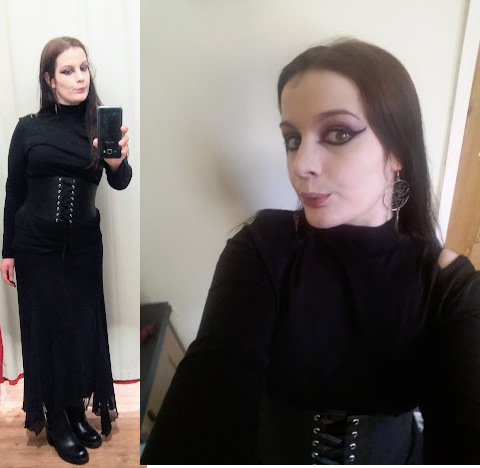 Especially with the winter here, I was donning wet look leggings (from Boyes in York ) and belly dancer belt ( charity shop in Bantery Co. Ireland). This is a handkerchief style skirt I purchased from a car boot sale from someone who was a doppelganger for Stevie Nicks. The top was charity shop find from the Marie Curry shop in South Shields. I wore this outfit while seeing Dan Reed doing an acoustic set that was awesome. This was my zombie witch outfit I was dancing in Bensham Grove. I think by this time most of the makeup had come off along with my green lipstick this was taken at 9; 30 pm and I was on 12-hour shift the next morning. I need to work so I can keep myself in underbust corsets and belly dancing belts. The top (Dorthy Perkins) I wore was charity shop find from Cancer UK. It has fantastic witchy sleeves with a bell drapery sleeve. My skirt was a Geordie Goth original with fabric obtained from the local Asian fabric seller, literally, its stone throw away from my house, which I love. The necklace was a Primark Cultural appropriation of an ethnic style necklace. I got on sale for £3. My corset wowed everyone like usually with numerous of lovely comments. 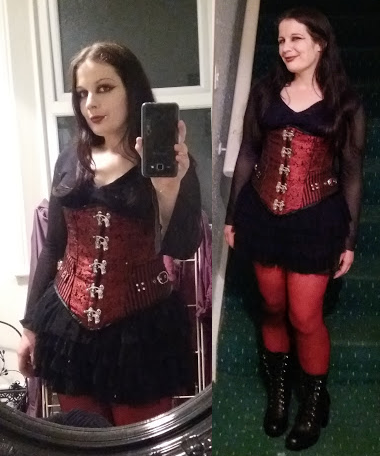 The underbust was £40, from a steampunk shop in Brighton. Sadly it appeared of to closed down I scoured most Brighton and Hove and didn't find it. I guess it's a sign of the economic climate which contributed to the demise of alternative and goth shops. I wore this outfit to see Star Wars. The mesh top has flock floral print; I bought for a pound from a charity shop. The skirt I one I sewn. 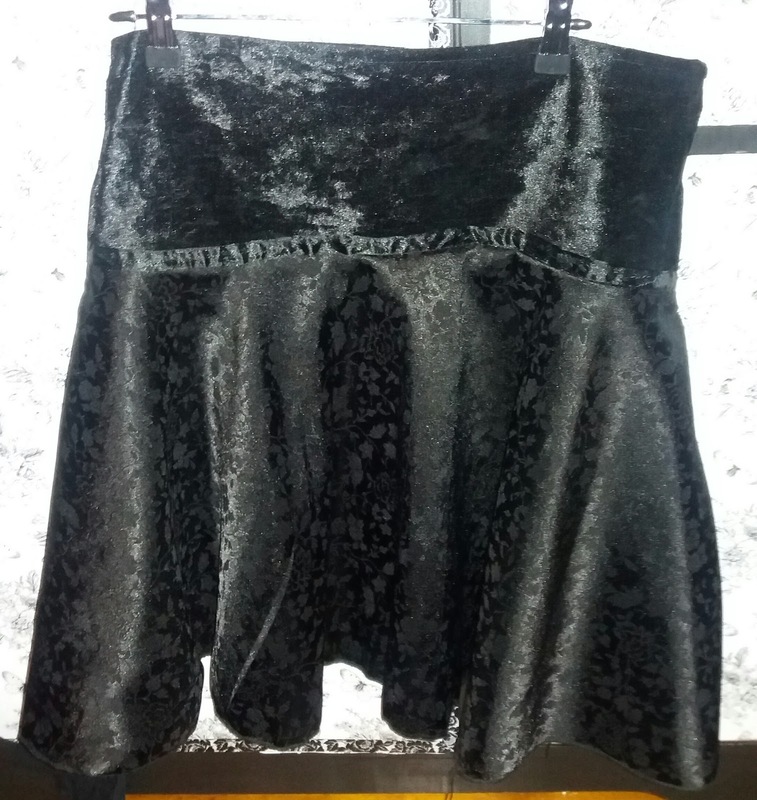 This is a picture of the skirt. This was an outfit I wore to Durham with the Boyfriend. I feel this was more of nu goth style. I finally found a cold shoulder top, from Next for £5 in the Christmas sale, that doesn't show my arms, I hate showing my arms off since I have bingo wings. The skirt a Per Una skirt I got for £2 at the discount Cancer UK charity shop. The boots were ankles boots I got from a Maltese Market, last year. They're so comfy. The waist cincher was £4 from Primark. This was another random, the top an oriental top I sewed using New Look 6027. The skirt is a hippy style velvet skirt by Jordash, which I have had for yonkers. The belt is another charity shop find. This was just a random outfit the top is a charity shop find, the skirt was sewn by me and the boots were by Guess from Tk Maxx £50. I love some Guess clothing as they always seem to have a gothic undertone which suits my somber sensibility. My necklace was an onyx by Past Times, sadly its ceased trading. Nice corset! Nice waist cincher! Very eye-catching! I think Primark has opened in North East America in New York. I'm not sure where else it's opened. I'm sure they'll head for Canada soon. Branded clothing prices are getting stupid. Beanie hats with goth pins are £20 on some sites - I bought a basic black one from Primark and stuck in a gothic pin a friend gave me and it's exactly the same thing. Think my fave goth dress is the one I wore in Whitby that cost me £10 from a charity shop - as it was a John Rocha from Debenhams it was worth every penny. Thanks Jane, I'm looking forward to the clothing exhibition it'll be fun. I agree with general clothing prices are getting so silly both in alt and main stream fashion and the quality is shocking. I remember we were discussing this at our last meet. Lol. Maybe I'm just getting old and grumyp lol, but then again I have less money, better sewing skills and more common sense. Over the last few years, I found harder to find clothing I like but I've found the most awesome finds. Also, I'm running out of room in my wardrobe. lol. I need to be more strict with my spending. I'm still wasting money on crap, I'm starting to money into the house. Nice outfits! Especially I like the third one! Great outfits!! You look amazing in them all! Nice outfits^^ I also like to use unlikely fabrics for clothing pieces, I once sewed a long vest using uphostery fabric too. Thanks, I always like to push some of the boundaries where possible, sometimes it doesn't always work out. I like of your vest. Thanks for the advice sounds good I have a decent camera that I might see if I can find a remote compatible for it. love the roundup! your belly dancing belt is awesome! Actually all your waist accessories from your belts to your corset are killer! sounds like a lot of fun events too! Thanks. I love waist belts and hip or belly dancing belts I think they seem to finish an outfit off amazingly. I really love your clothes and the way you out things together. When I was a teen, I was Goth but my Grandma didn't like it and she's a big influence in my life. So I kind of packed that part of me away until last year when I said screw it, and came back out of the Belfry, lol. So, I'm building my wardrobe back up again too... which is kind of difficult because I am plus size. My Grabln was very accepting but she was just a very understanding person, and more about how people were. My Grandad hate it though. Both my parents thought it was a phase hoped I'd grow out of it. I'm verging on 30 I don't intend to Change then again I don't dress like that everyday. Like I said it's taken years for me to build my wardrobe. I think people, espcially yonger generations dont it takes time to build up a decent goth wardrobe. Unortunately we leave, in instant society of now now. Good luck for building wardrobe.Also, I'm not sure if you have heard of Holy Clothing they do plus sized and some lovely clothing. I still have a dress I bought years ago off then.